Six months ago, SMI Advisory Services announced that professional management of individual accounts using the SMI strategies was being offered for the first time. SMI members responded enthusiastically, pushing the assets under management in SMI Private Client to nearly $100 million! Until now, Private Client has been available only to those with at least $250,000 to invest. With the debut of Private Client Classic, professional management of the SMI strategies within a personal account is now available to anyone with as little as $2,500 to invest! Automated investing produces better long-term outcomes. This month’s cover article makes a persuasive case as to why investors perform better by limiting their own interactions with their portfolio. Anyone who has ever struggled with following the system versus freelancing a bit can see why automation and sticking with the plan are consistently cited in investing research as keys to success. 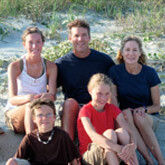 Private Client provides continuity for your heirs. Many people have noted this as a specific motivation for moving to Private Client. It’s not unusual for an SMI member to know and love the SMI strategies, but worry that their spouse or heirs know nothing about them. Meanwhile, many of the non-investing spouses have concerns about this potential transition as well. Getting set up with Private Client provides peace of mind for both that the investment handoff will be smooth, guided by a knowledgeable, Christian advisor from SMI Advisory Services. Simplifying your life is worth paying for. As Brian Portnoy, author of this month’s cover article writes, “Mental energy is not a euphemism. It is literally a limited physical resource, so we want to engage our effortful brain in the most efficient way possible.” Some people love managing their own investment portfolio. Others don’t. Every day, each of us chooses certain aspects of modern life to outsource, while retaining others to handle ourselves. Portfolio management is no different. So if you don’t enjoy it (or feel you don’t have time to do it well), perhaps it’s time to outsource that task and free up your time and mental energy for something else. How does Private Client Classic work? The Classic tier of Private Client functions much like the Select and Premier tiers described in March, with a couple of key exceptions. Importantly, all three tiers provide the same professional management of the SMI strategies. The actual investing decisions and the portfolio managers making them (led by Mark Biller) are the same for all Private Client accounts regardless of tier. The difference between Classic and the other tiers involves how clients interact with SMI Advisory Services. Select and Premier clients work directly with an advisor to get their accounts set up, and those advisors handle any follow-up questions or issues that come up in the future. Classic clients handle these processes online and via email, without speaking directly to an advisor. Rest assured that Private Client’s online process for getting set up is state of the art, the portfolio selection process is intuitive and easy to use, and help in getting started is always just an email away. The ability to establish an account and select a portfolio online means you can do it at your convenience, while also allowing SMI Advisory Services to offer fully-featured professional portfolio management to accounts as small as $2,500. That’s unheard of in the industry, where professionally-managed, personally customized, multi-strategy portfolios normally aren’t available for those who don’t have large accounts. 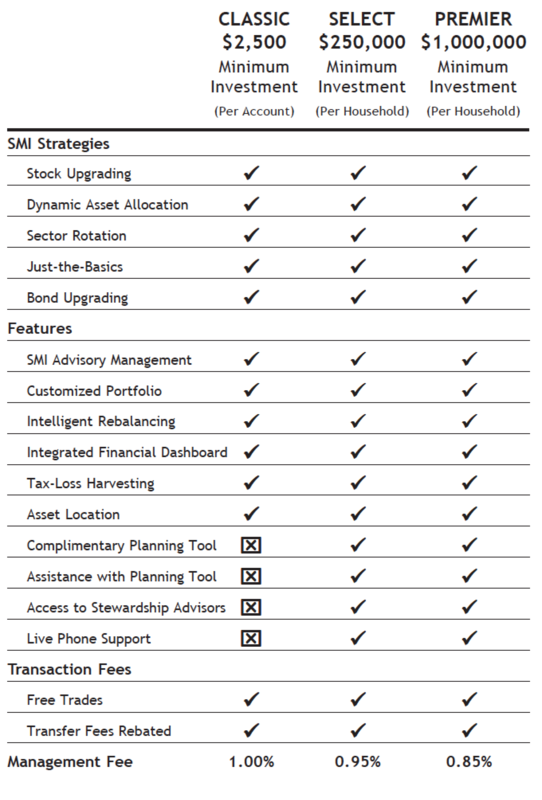 As the comparison table below shows, other than advisor interaction, the only other feature not available to Classic clients is complimentary access to the MoneyGuidePro® planning tool (and direct assistance with that tool from SMI Advisory Services). However, access to that same tool is available to any Premium SMI member for a one-time fee of just $50. Over SMI’s nearly three decades, we’ve seen many readers sacrifice using the SMI strategies in order to outsource their portfolio management. In some cases, the person specifically needed planning or other expertise from an advisor. But more often, the reader simply wanted someone else to manage their portfolio for them. 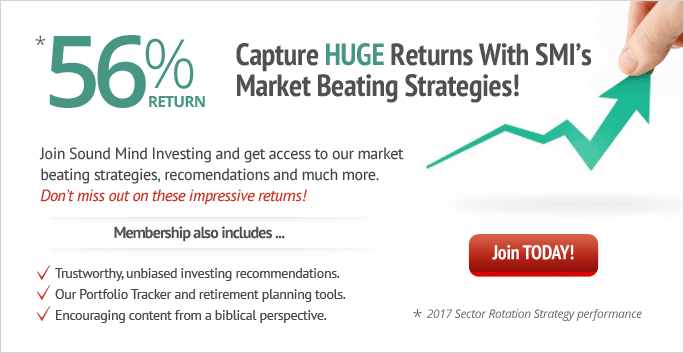 Thankfully, there’s no longer a need to choose between using the SMI strategies and having your portfolio managed by a professional. Private Client offers both at a reasonable price. In addition to the benefits already discussed, you won’t have to forgo any SMI strategies because of the added complexity of managing them (as many SMI readers do when managing their own accounts). Each of us has only 24 hours in the day and a certain amount of mental energy to spread around. If you’re not currently keeping up with your portfolio the way you know you should, if you simply don’t want to handle that responsibility anymore, or if you’d like to ensure financial continuity for your loved ones, check out smiprivateclient.com online. Not sure if it’s for you? “Test-drive” the risk assessment and portfolio proposal steps of the process free of charge by clicking the “Get Started” link at the top of the Private Client page — with no obligation or officially becoming a client (which doesn’t happen until you sign documents). Private Client makes it easy to have your cake and eat it too, providing flexible options for those who want to use the SMI strategies, without carrying the responsibility of implementing those strategies themselves.